It’s easy to spend time drinking coffee and wandering from temple to temple in the Unesco World Heritage portion of Luang Prabang. However, the province also offers spectacular natural wonders and hidden gems for those who venture outside the town. Here are the top day trips from Luang Prabang, Laos. The journey through the winding hills to get to Kuang Si is gorgeous. Resist the temptation to rush to the falls and wander around the beautifully curated, Dutch-run Kuang Si Butterfly Park located 300 metres before the entrance. Once you buy your ticket to Kuang Si, you’ll walk through the Sun and Moon bear sanctuary before reaching the aquamarine pools. Swim at the bottom or the hidden pool at the top. Take the slow boat up the Mekong to Ban Pak Ou. There are two caves to visit. Hike up the long staircase to the pitch black upper cave, Tham Theung. The lower cave, Tham Ting, is smaller and less busy with some sunlight shining through. 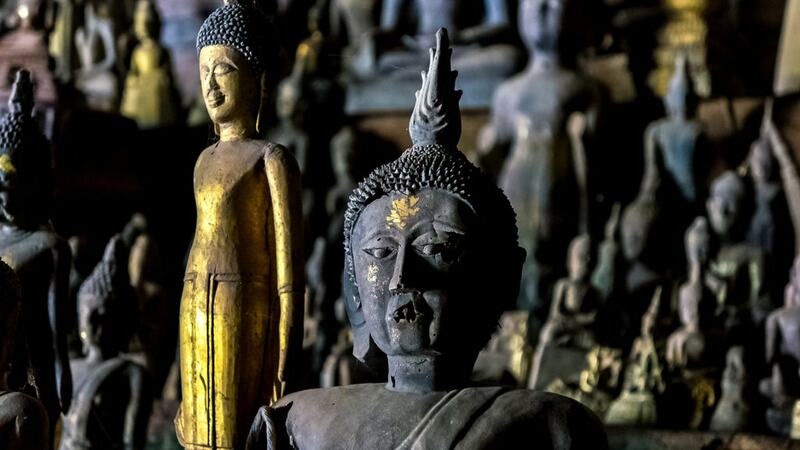 Both caves are pilgrimage locations for devout Buddhists who have been leaving carvings of the Buddha in the caves for centuries. Over 4,000 statues are located inside. 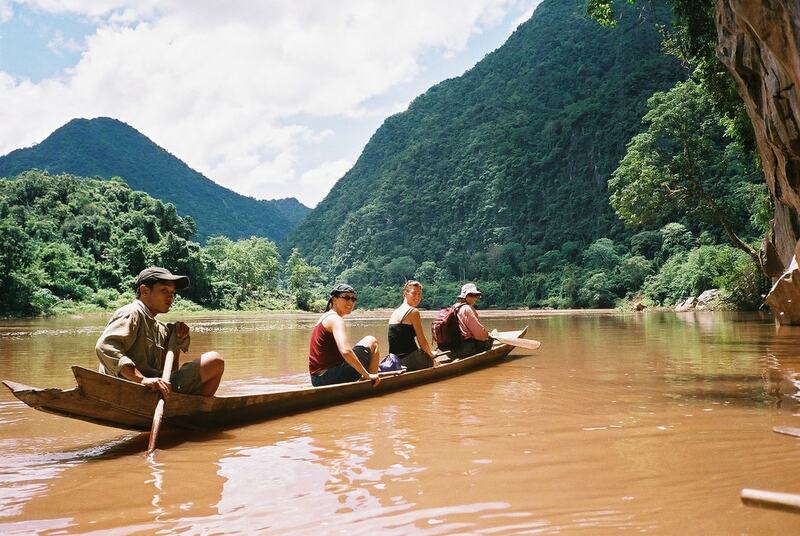 If you’re heading to Pak Ou Caves, the Botanical Gardens or Tad Sae, part of your journey will include a ride on a river boat. Many travellers come to Luang Prabang via the slow boat from Thailand. Others just want to get onto the river to better see the mountains and take in the sunset. Check out the Sa Sa Sunset Cruise for great music and hospitality including a free mojito and barbecue skewers available for purchase onboard. 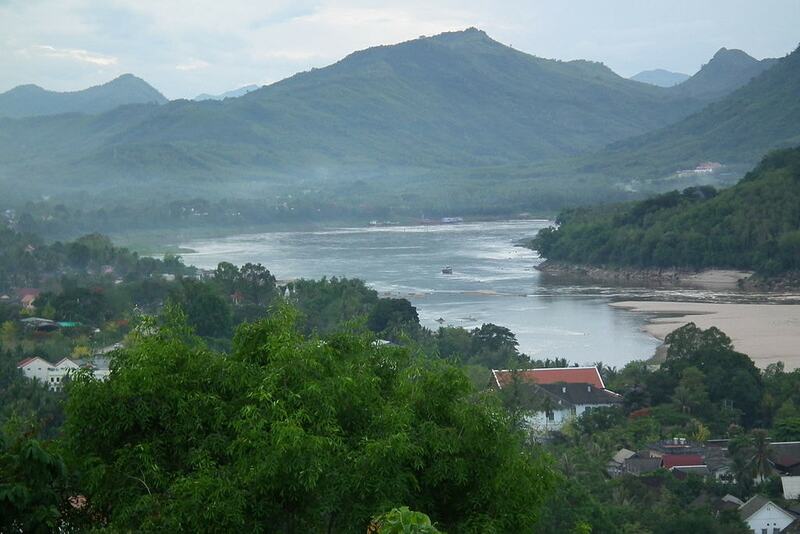 Nong Kiaw is a town on the Ou River four hours north of Luang Prabang surrounded by beautiful limestone mountains. Check out the Pha Tok Caves, waterfalls, and hike to the top of Phadeng Peak for a stunning sunset. Don’t forget a flashlight for the way down. Other attractions include Jungle Fly Ziplining, kayaking and mountain biking. Take the ferry across the Mekong River to Pha Tad Ke Botanical Gardens. 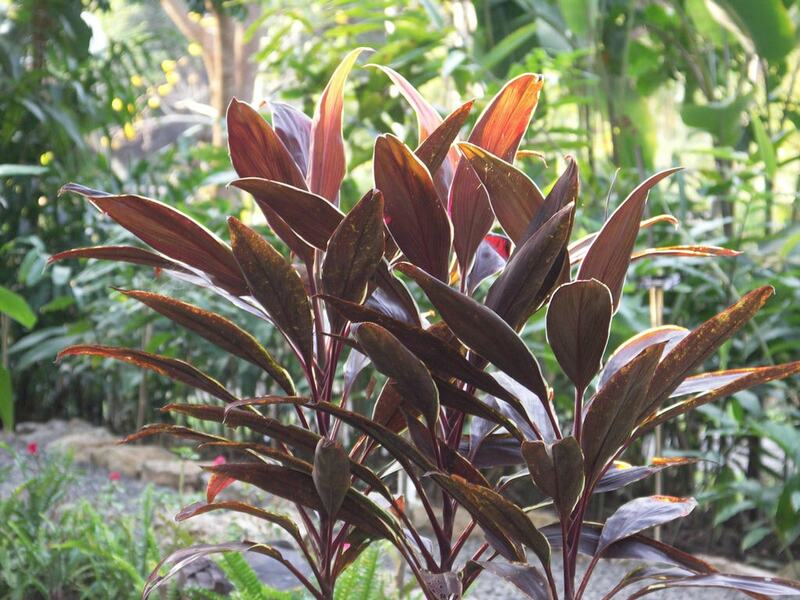 The first botanical garden in Laos, Pha Tad Ke opened in 2016 with the mission to collect and research the plants in the country and teach the public about horticulture and botany. Wander through the gardens, attend a tea-tasting at the cafe or partake in a bamboo handicraft workshop. An hour’s boat ride north of Nong Kiaw lies the sleepy town of Muang Ngoi. Hire a local guide to take you trekking, either for the day or on an overnight camping expedition. This riverside town is also known for boating and kayaking, as well as caving. Many of the local caves sheltered people during the bombing raids of the Lao civil war. Bomb remnants have been repurposed all around town, serving both functional and decorative purposes. Take cash with you, because the town lacks an ATM. Tad Sae is best visited around August to November, when the multi-tiered cascades are raging and the swimming pools are at their bluest. The falls are only accessible by boat. Head to Ban Amen village then take a 10-minute boat ride up the Nam Khan to the falls. Bring a picnic lunch and hike to the upper two tiers of the falls to take in the views. Whiskey Village, or Ban Xang Hai, is a popular stop in conjunction with Pak Ou Caves. 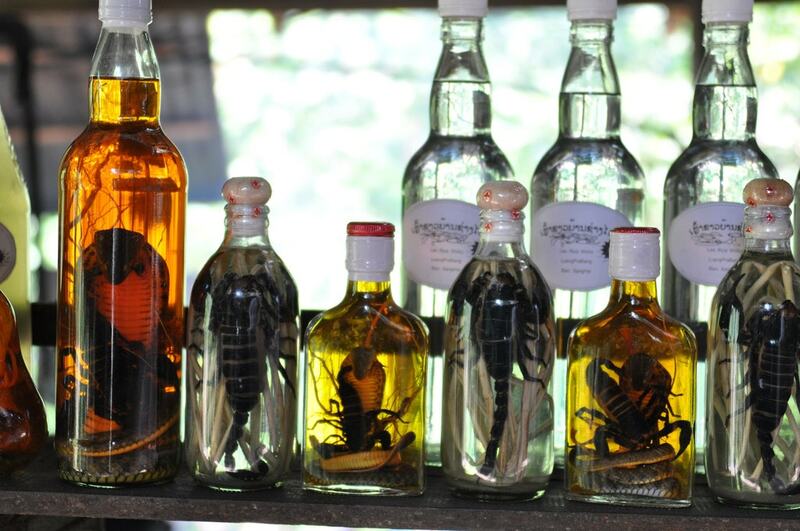 The small village is famous for distilling and selling Lao whiskey. The presence of creatures – ranging from snakes and scorpions to lizards – have various medical benefits according to locals. The liquor packs a punch and is made from sticky rice. In addition to liquor, many village women are weavers and sell scarves, skirts and other items that are made on giant looms set up underneath their houses. Rent a mountain bike or motorbike and take the ferry to the other side of the Mekong to explore Chom Phet. While it’s geographically so close to down town Luang Prabang, you’ll feel like you’re a world away on dusty roads that will lead to the empty Wat Chom Phet, Sakkarin Cave and Wat Long Khun. Enjoy riding past the rice paddies and locals’ houses on the quiet side of the Mekong. 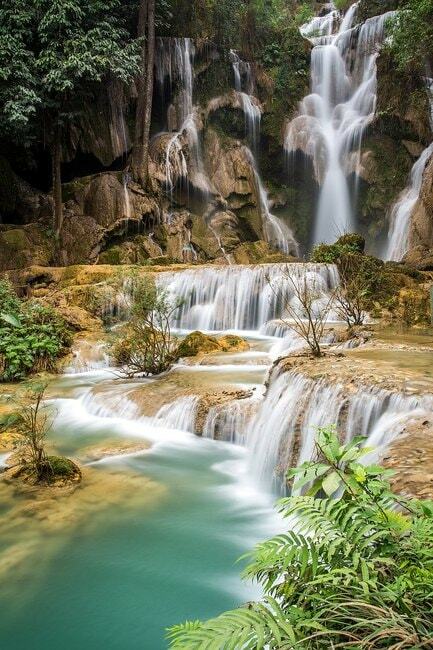 Six kilometres from Luang Prabang lies Tad Thong Waterfall, which is surrounded by a beautiful park and has a hiking trail for visitors to take a nature walk around the falls. 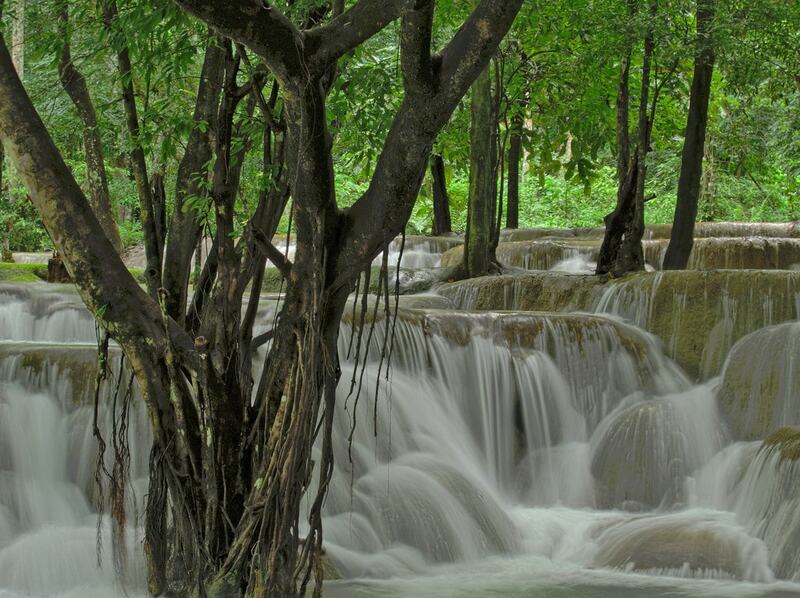 While far fewer tourists visit Tad Thong than Tad Sae or Kuang Si, the lack of foot traffic makes these falls a quiet getaway near the city centre. Carry water with you and wear proper footwear to climb up the often muddy trail.